Tickets will go on sale on Saturday, March 17th at 10 am. Fans may purchase tickets online at livenation.com andticketmaster.com; they can also call Ticketmaster's toll free Charge By Phone number 1.800.745.3000 or visit any Ticketmaster retail outlet. Tickets will also be available at the Cricket Wireless Amphitheatre box office on Saturday, March 17 at 10am, subject to availability. 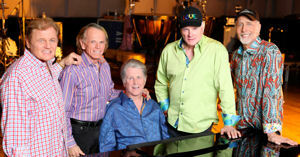 Up to the minute tour date and ticketing information can be found atthebeachboys.com. The Beach Boys continue to hold Billboard / Nielsen SoundScan’s record as the top-selling American band for albums and singles, and they are also the American group with the most Billboard Top 40 chart hits with 36. Sounds Of Summer: The Very Best Of The Beach Boys is fast approaching triple-Platinum sales status, and The SMiLE Sessions, released to worldwide critical acclaim in November, has been heralded as 2011’s #1 Reissue of the Year by Rolling Stone magazine. Inducted into the Rock and Roll Hall of Fame in 1988 and recipients of The Recording Academy’s Lifetime Achievement GRAMMY Award, The Beach Boys are an American institution that is iconic around the world.